Our interactive and engaging summer camps provide students with unique experiences to practice and strengthen skills needed for academic success. Students will be challenged to think critically and encouraged to utilize problem-solving skills in a variety of contexts. While each camp is based around a particular theme, each includes activities focused on maintaining math and literacy skills, character building, physical and mental exercises and everywhere in between. It is our goal to foster a commitment to life-long learning in all of our Stutelage students! Our teachers take into consideration the ages and grade levels of the campers to plan activities that will be appropriate for each camper. After the instructor meets the campers on the first day, he/she will adjust the materials and lessons for the rest of the week to meet each child’s individual needs. Although all campers may be exploring the same topic, each individual camper will have differing levels of complexity within each activity to best match their academic needs. By differentiating our instruction, our NYS certified teachers can provide individual attention within a group setting. However, please note that our camps are designed for ages 3-10 unless specifically noted on the individual registration pages. As our teachers are responsible for many students at a time, we do not allow students younger than the age of 3 participate in camps. Younger children must be able to go the bathroom independently, participate in a school-like setting, and be able to complete basic academic-related tasks such as using scissors and following directions. We welcome all children to our camps, however, due to the nature of the camp, children should be able to behave appropriately in camp. We reserve the right to ask a child not to return to camp if their behavior inhibits the learning ability of the rest of the students. We take great pride in creating an exceptional learning environment and summer experience for all of our campers. Our instructors are all NYS certified teachers who are passionate about teaching! We can’t wait to learn with you this summer! 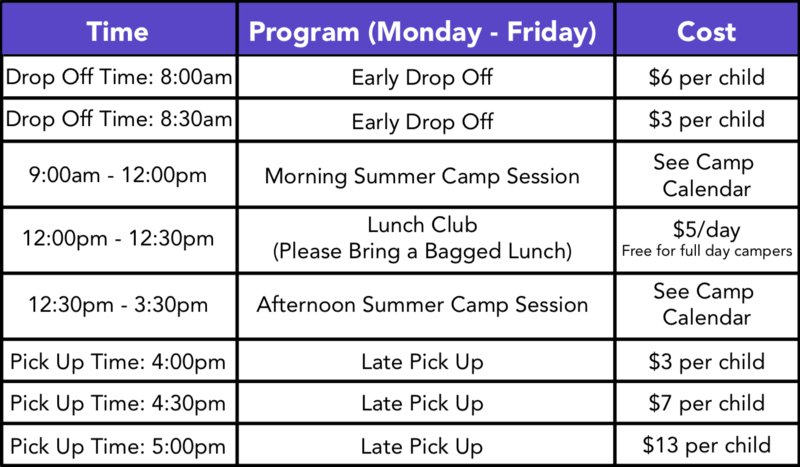 FREE supervised lunch is available Monday-Friday from 12:00-12:30pm for campers staying for morning and afternoon camps. If you would like to add on lunch club to your morning registration, the cost is $5 a day. Please register for paid Lunch Club spaces. **Please note – we do not provide lunch. Campers bring a nut-free bagged lunch. Early Drop-Off is available starting at 8:00am. Late Pick-Up is available until 5:00pm. Must pre-register. 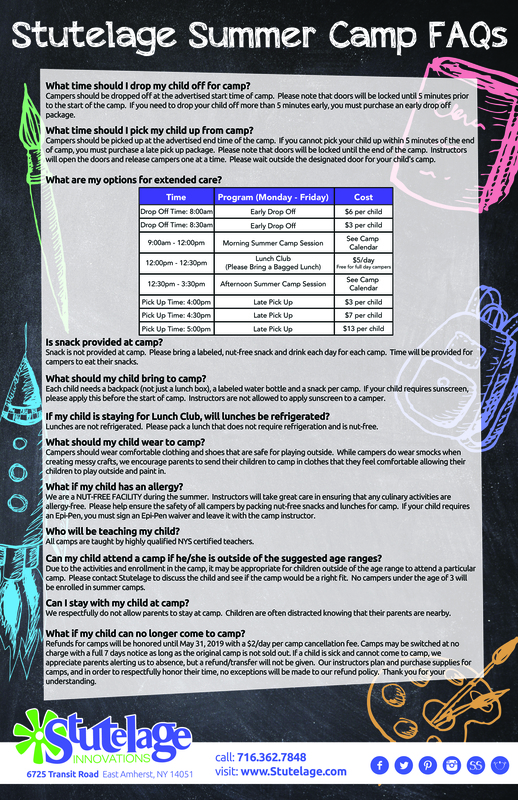 2019 Summer Camp RegistrationExtra Care OptionsSummer Camp FAQs Questions? Contact Us! Grab your spidey silk and swing in to this super fun summer camp! Come with us to discover the amazing world of spiders as we learn about the strength of these eight-legged creatures. We will create a number of web creations and hero stories. Campers will swing through a Spider-Man obstacle course and create delicious pretzel web snacks. Hope your spidey sense is working and you find your way to this super camp! Flip your fins and get ready for some awesome mermaid fun! Campers will create their own mermaid tails, discover buried treasure and even design their very own mermaid trap! We will also be experimenting with exploding treasure chests and zenning out with some mermaid yoga. So, come join us on this amazing under the sea adventure! They’re tiny, they’re cute…. SURPRISE! They’re L.O.L. Surprise Dolls! These dolls are unique, adorable, and totally collectable! If you love L.O.L Surprise Dolls, you will love all the fantastic activities planned for this week. Campers will be making Sugar Queen headbands, experimenting with glitter lava lamps, and mixing together some glitter slime. Come join us as we dress like our dolls and bring our favorite dolls in for show and tell! Are you a fan of Pikachu and the Pokémon world? Come join us as we save the world with Detective Pikachu! In this amazing camp, we will make our own Pokémon cards and game boards. We will have a blast singing the Pokemon theme song, making delicious cookies and learning about volume. If you love Pokémon, this camp is for you! Calling all superheroes! Join us and let your powers shine! Campers will create their own hero capes and symbols, train to fight villains, and even capture their own galaxy in a jar! Unleash your creativity and discover the hero within you! Join Max, Chloe, and the rest of their pet pals as they continue to create mischief when their owners are at work! Stutelage campers will make delicious puppy chow, craft character perler bead creations and try out some origami with bookmarks in the shape of a favorite character, Max! This camp is sure to be tail wagging fun! Millions of dolls are made everyday… but what happens to the dolls that aren’t so perfect? Welcome to UglyVille where being different and unique make everyone special! Come find out what makes you special at this one-of-a-kind camp. Campers will enjoy making pipe cleaner finger puppets, snacking on monster krispie treats and learning about all of the characters in the brand new UglyDoll movie! Minecraft has taken over the world! Come join us as we create our own minecraft landscapes, pickaxes and other fun minecraft projects. We will learn about real life miners as well as the minerals they pull out of the ground. Campers will examine how mining has transformed the world and led to all of the wonders of technology we enjoy. Come have a blast with us as we learn about Minecraft and how to get the most out of this creative and engaging game! Calling all candy lovers! Come to Camp Candyland to get your fill of everything sweet this summer at Stutelage. Campers will make gumdrop structures, play lollipop toss, create candy necklaces, experiment with their senses and so much more. Bring your sweet tooth along and be ready to have some candy fun! Our world is being transformed and science is the key. If you love learning new things about the amazing world we live in, this is just the camp for you. We will explore awesome topics about our planet and the animals living on it. Together, we will learn about the depths of space and we will teach each other topics that we investigate in groups. This science-packed camp will feature fun crafts and activities from making our own slime to measuring moon craters. Hope to see all of you young scientists there! Read aloud and proud with our storybook camp. It’s not just about getting lost in a good book, but learning other skills within the pages too. Build a bird’s nest and learn all about the clock, all while enjoying a good story every single day, only at Storybook STEM camp! Each day, we will read two storybooks and complete two STEM challenges where campers will harness their creativity to become young engineers! Gerald & Piggie are best friends, but they couldn’t be more different! Come join us as we explore everything about Gerald and his best friend, Piggie, in this adorable, fun Elephant & Piggie Camp! Campers will enjoying playing games such as Pass the Ice Cream and Bird on Your Head Walk, making Friendship Ice Cream, and even making our own toys just like Piggie’s new toy! Anybody who loves the Elephant & Piggie book series is sure to love this camp! Join us as we read, make, and play alongside everyone’s favorite cat! Pete the Cat is the grooviest cool cat in town and he is bringing his hilarious stories over to Stutelage! Campers will mix their own groovy-inspired slime, make Pete the Cat headbands, participate in pet yoga and enjoy some Pete the Cat snacks! This camp is sure to be a rockin’ good time! The mission of our Summer Sports Camp is to further develop self-confidence, character, and maturity of each individual. The camp will allow campers to gain a further understanding and appreciation of physical fitness and various sports. In a supportive, team-centered environment, all campers will develop their skills while gaining an appreciation for each specific sport. Each day we learn about the sport, participate in skill practice, play games and tournaments and debrief on the day’s activities. This camp is perfect for boys and girls who love athletics or are looking to try new activities in a friendly environment! *Please note – this camp is for ages 6 – 11. Woody and the gang are back! This Stutelage camp features everything we love about Toy Story. Campers will be making paper chain slinky dogs, discovering how wooden toys are made, and reading about Buzz and all of his friends. You’ll love STEAM Mania where we will use creative solutions to solve the characters’ tricky problems. Come join Woody as we celebrate the new movie Toy Story 4! *Doll not required to attend. Join us at Stutelage this summer for a whole new American Girl Doll Camp! This camp is for all kinds of doll lovers! Here, we will learn how to care for our dolls, create miniature doll games, make doll sweet treats and so much more. Bring your favorite doll along for some fun at Stutelage! Hakuna Matata friends! Join us as we explore the amazing world of Simba and his friends. Campers will learn about the animals of the pridelands, create smoothies fit for Timon and Pumba and even design their own painted lion canvases. Explore the wonders of Africa and all of the magic that is the Lion King! Join us at Stutelage for everything pink, pretty, and relaxing at our Pampered Princesses Summer Camp! Campers will love making fun fairy princess wands, learning how soap is made, and snacking on princess popcorn. This camp is full of girly, glamorous fun! Come join us for some fun in the sun with our summer beach bash! You’ll love playing Pass The Water, making a delicious seaside snack, and even participating in beach yoga. Throw the surfboard and towels in the car, because we’re going on a beach party adventure! Join us at Stutelage for a super silly adventure at Junie B. Jones Camp! Each day, campers will explore a different Junie B. Jones book and get all mixed up in Junie activities! Campers will make pipe cleaner monkeys, make mini cakes, create their own personal beeswax journals and so much more! Bring your giggles to Stutelage for a week of Junie B. Jones fun! Are you ready kids? Aye Aye Captain! Come join Captain Dan as we explore the wonderful wacky world of Spongebob SquarePants. In this camp, we will make Spongebob crafts, create a colorful jellyfish and learn about real life sponges. Get ready to drop on the deck and flop like a fish as we dance our way through this amazing camp! Hola amigos! Come and explore with Dora, Boots, Diego and the rest of the Dora the Explorer gang at Stutelage this summer! We will go on all sorts of adventures and create our own explorer binoculars, backpack goody bags, flower bead bracelets and more. Help us catch Swiper and blow bubbles with Benny at our Dora the Explorer Camp! Stretchy, gooey, sticky, crunchy, colorful, irresistible SLIME! The craze of slime continues to grow as new and unique slime recipes are discovered. This week, campers will make 10 different types of slimes using a variety of materials. There is sure to be a slime that you haven’t tried yet. Enjoy making fluffy cloud slime, candle wax slime and even some slimes that you can eat! Roll up your sleeves and lets get started! *Please note – both Slime Time Session #1 and Slime Time Session #2 are the exact same camp. Be a paleontologist for the week at Stutelage’s Digging for Dinosaurs camp! Here, campers will learn all about dinosaurs as they make fizzing dinosaur eggs, create salt dough fossils, cook up dinosaur dirt cups and more. We will be exploring history and getting a sense of what our world was like when dinosaurs inhabited it. Don’t miss your chance to dig up dinosaur bones with us! The villains are back and just in time for this wicked camp at Stutelage! Campers will enjoy making marbled Cruella cupcakes, designing character-inspired bracelets, and experimenting to see if magic potions are real. Campers will test themselves to see if they are “rotten to the core” or if we are naturally driven to be kind. This camp is sure to be a wicked good time! Hello, all you Lego Lovers out there! Do you have a blast with legos being creative? If so, this is the camp for you. We will make a variety of projects out of Legos including ships, buildings, bridges, glasses and, to top it off, a massive castle that we will destroy with our very own rolling catapults! This camp is great for boys and girls who just want to have fun with legos and for those who want to to create some amazing Lego-based crafts! Help wanted at Stutelage! Stutelage is currently seeking Chef Campers that are interested in cooking all sorts of yummy dishes! Here at Cook-a-Palooza, campers will make blueberry muffins, cheese quesadillas, monkey bread and so much more! Impress your parents as you learn how to safely prepare some tasty favorites this summer. Join some our favorite characters as we return to Agrabah for the return of Aladdin! Campers will learn all about how carpets are made, discover our deepest desires, create sparkly accessories and sing along to all of the classic Aladdin songs. Come join us on a magic carpet ride as we explore all things Aladdin! Long long ago in a Galaxy far far away, Luke Skywalker went on an amazing journey to save the people of the Galaxy from the evil Emperor and terrifying Darth Vader. Come join us as we go on our own voyage through the stars in this Galactically fun camp! We will make and train with Lightsabers just like the real Jedi. We will also create our own Star Wars stories as well as a many awesome crafts like a Millennium Falcon Painting, Yoda Ears Headband and an R2D2 craft. Training starts this August, and Master Jedi Mr. Dan cannot wait to show you the wonders of the force and the amazing universe it holds together! Queen Elsa and Princess Anna are embarking on a new adventure with their friends Kristoff, Sven, and Olaf. Come join us at Stutelage as we turn summer camp into a frozen wonderland! We will be investigating why snow is white, chilling out in the kitchen while making frozen frost bites, and making sparkly beaded snowflakes! Don’t Let It Go…sign up today! “Donut” you want to join us at Stutelage for Donut Camp? Every day campers will be trying a new baked donut recipe. We will be making everything from Funfetti Donuts to Old Fashioned Cake Donuts, playing donut bingo, learning how we can sprinkle others with kindness, and even making donut scented soap! This is sure to be a sweet week! Unicorn Camp is coming to Stutelage in all its glittery, whimsical glory! Campers of all ages will enjoy making unicorn canvas paintings, decorating some edible unicorn horns, and participating in a unicorn horn toss. Campers will also read the adorable story “Not Quite Narwhal” and paint wooden spoon puppets to re-enact the story! This camp is perfect for anyone who loves the magic and sparkle of all things unicorn! Super spy Lance Sterling and scientist Walter Beckett are almost exact opposites, but they have to rely on each other when the world’s best spy is turned into a pigeon in this new hilarious movie. Become a super sleuth at Stutelage as we go on top secret missions, learn inferencing techniques, and make our own decoder wheels. We will make giant fingerprints, create silly disguises and even solve our own mystery! Ahoy mateys! Come find the buried treasure at Stutelage! Campers will learn how to make a wet compass, create their own treasure maps using cartography skills, and build their own LEGO pirate ships to compete in a STEM building challenge. We will also be making egg carton treasure chests to keep our jewels safe after our treasure hunt! “Arrrrrgh” you ready to have some fun!? Cue happy face emoji. Emoji Summer Camp is back and better than ever! Campers will make emoji mini notebooks, learn all about how emojis were created, and create some sweet treats. You will love learning origami, making your own music and creating hilarious stories. This camp is sure to make anyone smile! Oh, wondrous water! If you love the summer because it’s time to have wet, wacky fun, Stutelage is the place for you! Campers will enjoy learning all about underground water, creating beautiful raindrop suncatchers, and playing some fantastic water games! Bring your suit and towel on Wednesday and Thursday and get ready for a great time! “Bows Make Everything Better!” Don’t you agree? Join JoJo and BowBow as we take on the popstar world of bows, glitter, and everything glamour! JoJo campers with make their own JoJo inspired bows, make bow shaped chocolate candy, and have a popstar lip sync battle. Be your own kind of girl at JoJo & Bow Bow Camp!